You know you live in a house full of gamers when you personally know the staff at your local GameStop. As I walk around the game store, I found the Skylanders figures cute. I wasn’t really sure how they were incorporated in a video game, but I noticed that Activision publishes this game, so they probably know what they are doing. It should be noted that I am NOT a gamer. 😉 I was quickly educated that Skylanders Spyro’s Adventure combined a physical and digital toy experience, redefining a new model of children’s play. With the success of the Skylanders Spyro’s Adventure comes a new saga for this video game. The sequel, Skylanders Giants, is a whole new game, not an add on to the original Skylanders. It is designed to allow your kids to bring their characters over from the previous game. Since all of the character data is stored on the physical model, your kids can easily bring that character into the new game. 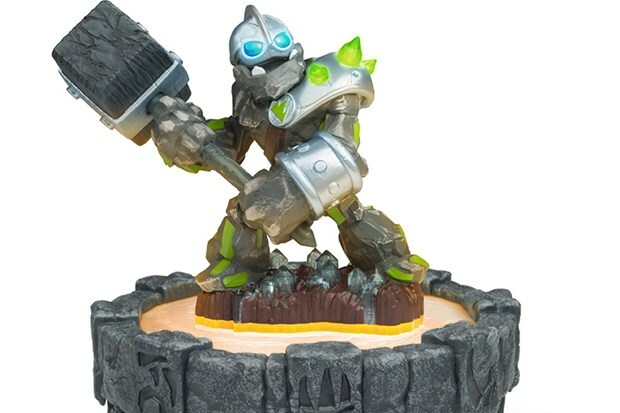 In fact, any Skylander they bring from the original game to Giants will be upgraded. This is great news for Skylanders fans as the the original figures will not be devalued by the newcomers. Seeing the new Skylanders Giants figures at Time to Play Holiday Showcase, I am happy to recognize the same high level of design and craft being spent on each one. They are much bigger than the original models, and they bring their massive size into the game world as well. There is one Giant for each of the Skylanders‘ elements. Giants are able to interact with enemies and the landscape in a very different way than normal Skylanders. Like the previous game, Skylanders Giants will be available for just about every platform, and the characters are completely cross-platform. I absolutely LOVE this! If you’re still playing the original game, there’s backwards compatible content too. In addition to the toys and the game, there is also a vast (and FREE!) virtual world online at Skylanders Universe. It’s one stop shop for Skylanders fans providing hours of added value play for kids and tweens with creative and engaging elements. Your kids will have fun entering the portal and building their army of Skylanders this holiday season!